No kidding around this time. Just click the link and vote for Skip. 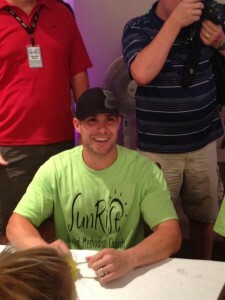 Skip Schumaker is the nominee representing the Cardinals in the annual Marvin Miller Man of the Year Award voting. Maybe you have no idea who Marvin Miller was. Maybe you know nothing about the award. That’s fine. Please vote for Skip anyway. If you just click the link and vote, you can skip the rest of this article (kidding, you can skip it anyway). the player in either league whose on-field performance and contributions to his community inspires others to higher levels of achievement. Skip certainly qualifies. He might even be overqualified this year. He certainly represents one of the best dual-threat impact players in baseball. Very few players can boast that they provide a legitimate backup/spot starter for a contending team. Most of those select few are not hitting anywhere close to .290/.353/.392/.745. Perhaps more importantly, I’m not aware of any others that can honestly say that they helped change the lives of potentially millions of babies yet to be born. When the state of Missouri announced that all babies born in the state would be tested for Krabbe Leukodystrophy, the good guys finally won something. Through Skip’s charity work, he had successfully increased awareness and brought together his local community to help support a family enduring the blight that is Krabbe Leukodystrophy. He did not simply attach his name to an event to help longtime friends Sean and Jamie Stutzman, he put his time and effort into it as well. In doing so, he created the tiniest ripple effect one can imagine. That ripple eventually grew to the point that it became an unmistakable agent for change. That change resulted in the enforcement of a state law now on the books. If that doesn’t qualify as inspiring others to higher levels of achievement, then I don’t know what does. Just vote for Skip. I’m pretty sure there is a link around here somewhere…. TIDBIT: Law that was passed but not enforced is called the “Brady Alan Cunningham Newborn Screening Act”. Increased awareness helped tip the scales in favor of enforcement. Missouri lacks the necessary lab capability to properly conduct the test, so the state will temporarily be using the same lab that New York state uses for the same testing.